"Thank you so much for your wonderful e-mail. We just returned from our honeymoon. Peter and I enjoyed having you play for our reception more than you could ever know. It was perfect. From the first note that I heard you play on the web site, I knew that I wanted your band to play at our reception. The evening turned out exactly as I had dreamed. The song selections and your presentation set a tone for the evening that was magnificent. We couldn't be more pleased. So many people have complimented us on your performance. I really hope that you know what a wonderful job you do. Working with you throughout the entire process was a great experience. It is clear that you really enjoy what you do in the way that you are so accommodating. I wish you the best of luck in your endeavors with the band. I hope that we will be able to help you get more jobs and that you and your band will get the recognition that you clearly deserve. Thank you again for making our reception such a memorable evening. You clearly set it apart from any other reception that I have ever been to and helped to make it very special. Best of luck to you and your band, I hope that we will have the opportunity to hear you again soon. I wanted to thank you for making the wedding day an event we will remember for the rest of our lives. I cannot tell you how many of our guests asked about the wonderful band. They all felt it was the icing on a beautiful wedding. Click the play button above to view our video clip! Large or small crowds, Swingmania accomodates any need from Combo to Big Band, with all the most popular and classic big band tunes. Click "Info" to learn more!! 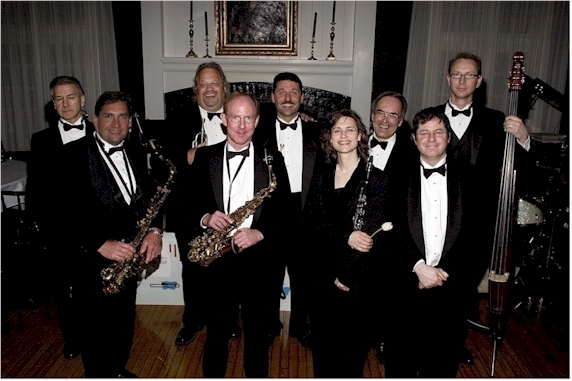 "I hired Swingmania for my daughter's graduation party and they were a big hit with everyone! These are extremely talented musicians. The singer has the voice of Sinatra. They could play anywhere--here in the Toledo area or in the Big Apple, they are that good!" I just wanted to extend a sincere thank you to you guys for doing such an EXCELLENT job at my wedding on Saturday in Findlay. Everyone commented on how great you guys were and how much fun they had. I cannot thank you enough for making that day so special for us. You have no idea how grateful I am. You are truly a talented bunch of musicians. You exceeded every expectation I had and could not have asked for a better evening. 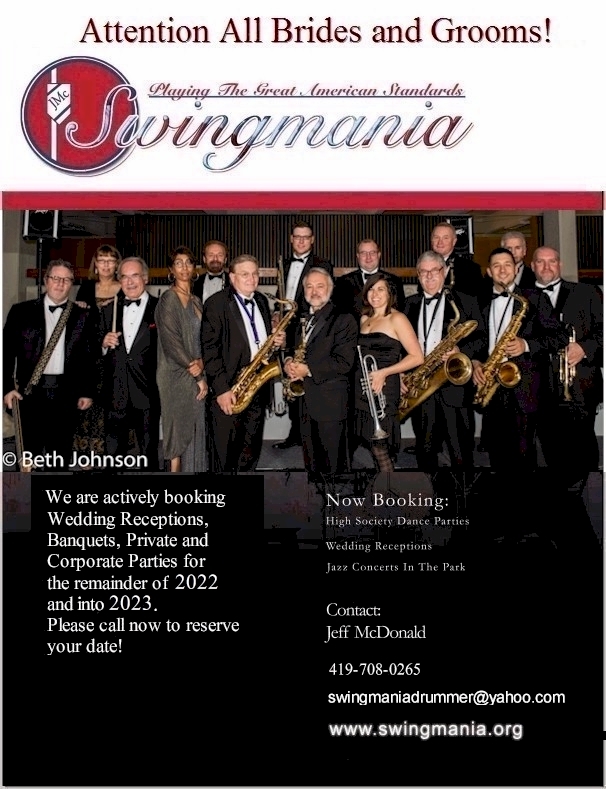 I just wanted to thank you and the members of Swingmania for doing such a fantastic job at our wedding reception. You created such a fun, happy atmosphere that made our special day fabulous. So many guests came up to us and asked where we found such an amazing band. We had such a great time dancing the night away. We will surely recommend you to family and friends, and we're sure our guests will, too! Thank you again, not only for your great music, but for your prompt replies and helpful answers during the wedding planning process. Thank you for making our day special.. You were so wonderful ! We will always appreciate you. This site created by Chwalik Internet Enterprises.